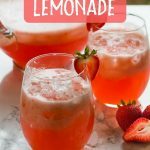 Make this easy Homemade Strawberry Lemonade in less than five minutes! There’s really no better time of the year to make an ice cold pitcher of Homemade Strawberry Lemonade than Summer! Fresh strawberries are in still in season for a little while longer and they taste so good at this time of year, this is a great way to use them up. I know we are used to seeing strawberries in the grocery year round, but the rest of the year they are usually imported and simply don’t have as nice of a flavor as the fresh in season ones. If you are fortunate enough to live in a part of the country with a pick your own strawberry farm nearby and you’ve never visited then you really should go, I guarantee they will be the best strawberries you’ve ever tasted. We lived in London when our children were little and there was a pick your own strawberry farm not too far from us in the Essex countryside. I can still remember the taste of the strawberries, they were noticeably different from the varieties you find in the supermarkets. They only lasted about a day or so after they were picked and you could see they were starting to get soft, not a problem as the four people in our house never usually let them last that long anyway! 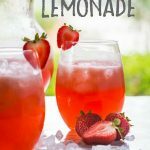 This recipe is very simple and starts out with one batch of my Fresh Squeezed Lemonade. In order to be able to make in in five minutes then I really recommend getting an small electric citrus juicer, they are pretty inexpensive and you can find them on Amazon for less than $20. The one I had broke a while back so I need to order a new one. I currently have a very simple hand juicer with a little glass bowl attached underneath which works just fine but it may take just a couple more minutes to hand squeeze all the lemons! You’ll also need a blender of course, mine is not a fancy one and works perfectly well for this sort of thing. 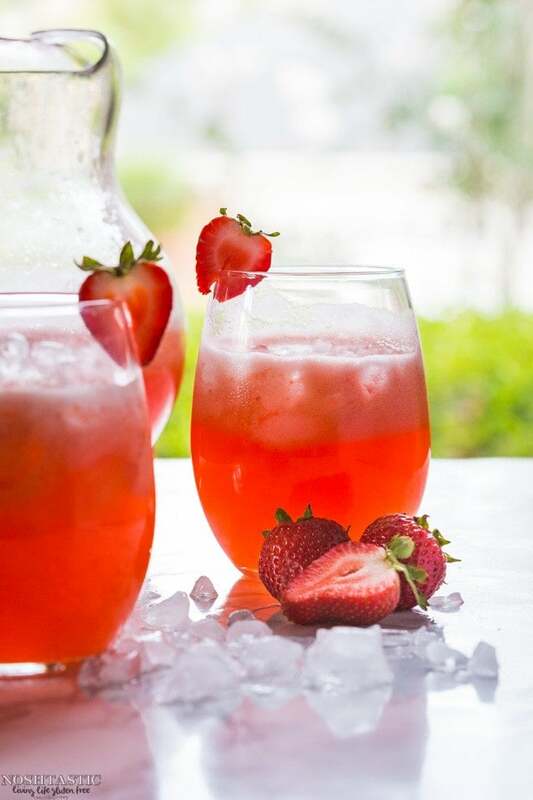 The taste and strength of your Strawberry Lemonade depends on two things, how many strawberries you use and how flavorful they are. I’ve given a guide for how many fresh strawberries I typically use, if you find that the taste is not strong enough for you then you can always add more to the blender until you get the taste you prefer. MORE RECIPES YOU MAY ENJOY! 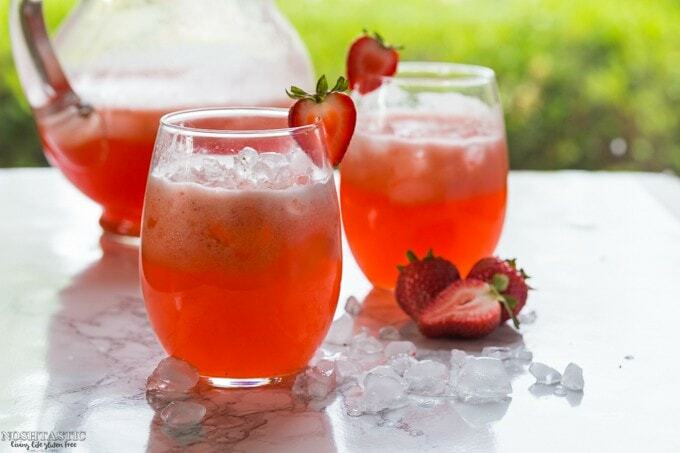 You will need one batch of my Fresh Squeezed Lemonade Recipe to make this. 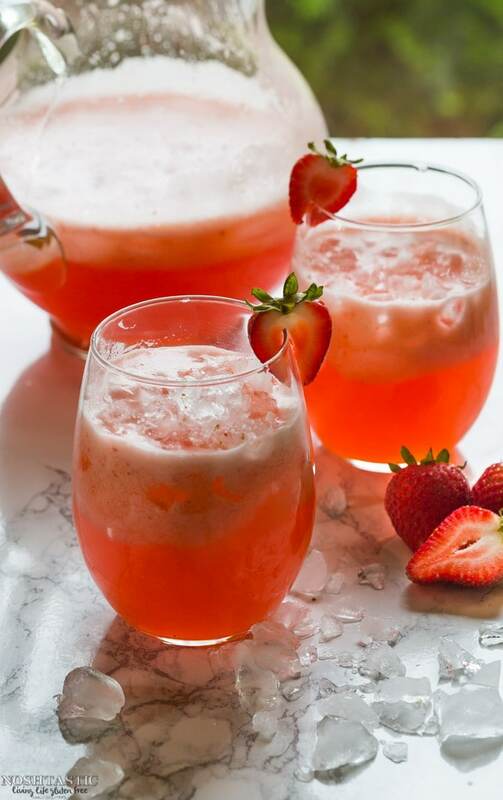 Add enough of the lemonade into the jug of a blender so that you have about 3/4 of the blender full, then add in at least 8-10 large ripe strawberries with the tops removed. If you don't like the 'bits' in your lemonade you can pour it through a fine mesh sieve. Thanks Tricia, it’s one of my favorites for sure!